There are a number of interesting points in this passage of Scripture. 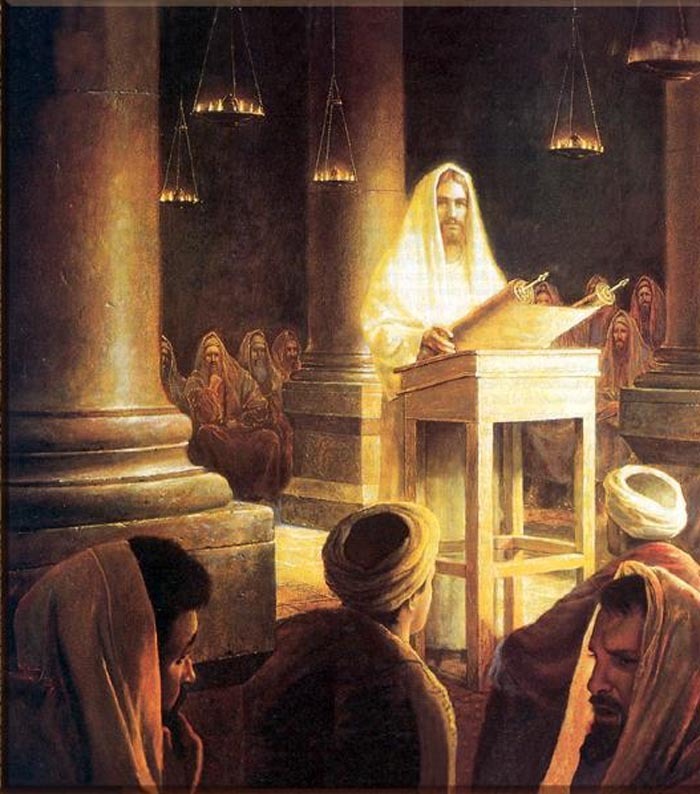 First, Jesus taught as one with authority. We do not do that. We relate what God has told us in Scripture. Jesus was God and could speak directly as God. Many of us would like to speak divinely, to have our words accepted as God’s truth, but we cannot. We claim as Christians that God has given us the Holy Spirit, but even when he gives us divine words to speak, they remain his words, not ours. We are not infallible and should be wary of thinking and saying that we are. Second, Jesus and his followers showed up to worship in the synagogue, but a man possessed by an evil spirit was also there. We often think of our church buildings and worship services, or even our own Bible study and prayer times, as oases, as havens of rest. But they are spiritual battlegrounds. Not everything we hear at such times is of God. We need to test all things and cast out what we find to be evil. Third, we have the healing of Simon Peter’s mother-in-law. Paul mentions that Peter had a believing wife who travelled with him (1 Corinthians 9:5). We do not know what the mother-in-law thought of Peter’s decision to become an itinerant preacher. However, we know that she was healed and she served Jesus. I must confess to having a niggling uneasiness when I read this passage. After being healed, the mother-in-law immediately began to serve. A voice whispers that Jesus was being selfish here, that he didn’t heal her for her sake, but only so she would serve him dinner. Isn’t it a bit much to expect a woman newly risen from a sick bed to do all the work? But another voice whispers that when Jesus heals, he heals completely. The woman was perfectly capable of serving. Moreover, the fact is that it is not Jesus who is selfish, but it is we who are selfish. Jesus came to serve, but we think that it is we who are the centre of the universe. We are so glad that Jesus saved and healed us because we are convinced we are important, and that is the end of the matter. The reality is that God has saved us and expects us to serve as he has done, out of gratitude and love and a serving heart. Yes, we are important, but so is Jesus and so are other people. We were not healed so we could rest but so we could work. Fourth, I read this passage many times before I noticed that people brought the sick and demon-possessed to Jesus “after sunset” (32). Why? Did it take that long for the news of Jesus’ healing powers to spread and for people to get there? No. The synagogue meeting probably took place in the morning. The people did not bring the sick to Jesus because it was the sabbath day (that’s why Jesus was in the synagogue) and Jewish law forbade travelling more than a few steps on the sabbath. How do we read this? As the people of God waiting patiently for God’s time to heal? Or as another example of human legalism delaying the healing work of God? After all, Jesus had already healed the demon-possessed man in the synagogue and Peter’s mother-in-law. The sabbath is for meeting God and being healed, not for following man-made rules. Finally, Jesus got up before dawn to go and pray. One of the remarkable things about this is that Jesus had had a late night the night before, healing all of the people who had come to the house. It must be remembered that the people who came after sunset would have had to come from a distance (the people who were within ‘a sabbath day’s journey’ could have come during the day) and they would not have started on the journey till sunset, so some of them would have arrived well after dark, perhaps late into the night. One might have thought that Jesus would have chosen to sleep in the next day and pray early some other day. He did not. Jesus needed physical rest after his long night of work, but ministering to people was even more spiritually exhausting than physically exhausting. In contrast, in the Garden of Gethsemane, the disciples chose physical rest over spiritual refreshing and as a result were too weak to resist the temptation to betray Jesus when they awoke. This passage is a reminder that spiritual refreshing is more crucial than physical refreshing. Continue and read the fourth part of this series by Jim.